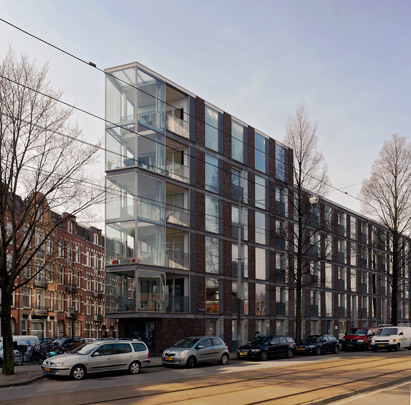 This project on the fringe of an early 20th-century quarter (Indische Buurt) divides 128 housing units among four segments in three perimeter blocks. Terminating these blocks, they imbue the quarter with a new contextual thrust. The nearby railway line and busy main road gave cause for anti-noise measures. The several house types vary from broad, shallow units to communal dwellings and maisonettes, recognizable by their double-height sun rooms. All are reached from access galleries on the inner sides of the blocks. Facades alternate strips of glass and brick; the sharp corner in the street plan prompted the all-glass bay windows.